You can consider me pretty much the biggest boots fan. Every year, I get a pair of black boots and wear them almost everyday through the winter. This year, I was contacted by BEARPAW to do a giveaway of their boots on my blog and I was also sent a pair to review. I was so excited when they agreed to send me a pair because I've heard great things about the company and the quality of their boots. For the review, I was sent a pair of the Emma 12" sheepskin boots which retail for $75. These are the best quality boots that I've ever had. The outside is very sturdy and nice. The inside is thick and furry. The boots are extremely warm and comfortable. I've worn these a few times already to my internship, raking leaves, out to eat, etc. They feel so great and look nice with every outfit including a skirt, skinny jeans, sweats, and much more. I also love the other boots that the company sells seen below. BEARPAW was started in 2001 by Tom Romeo with the hopes of redefining casual footwear. 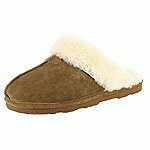 He used sheepskin to create the stylish shoes that you see from BEARPAW today! The material helps to naturally regulate the temperate so that your feet stay cool when it is hot and warm when it is cold. The company sells boots, slippers and casual footwear using quality materials. There are several different collections of shoes to check out including the classic, tahoe, and campus collections. BEARPAW has many great shoes to offer. Check them out! UPDATE- 12/5/12- These boots have held together for over a year now and are still in good shape. The only piece of advice that I would give is to buy half a size smaller because once the fluffiness wears down, these boots are large on me. ***Also, check out BEARPAW on Facebook and Twitter. I love Bearpaw Boots! I've never had a pair myself, but my daughter gets a new/different pair every year. 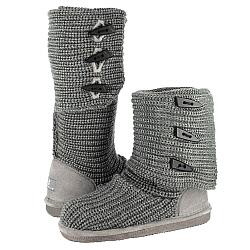 Bearpaw sure has some very pretty boots, she says they are so comfortable and soooo warm & so pretty, she really loves them! If you do a giveaway I'll be back to try to win a pair for myself. Nice Review! Those are too cute! I've never heard of Bearpaw Boots before. Hello! I'm following from the Whimsical Wednesday Blog Hop! I'm following through Google Friend Connect, Facebook, Twitter, etc., if applicable! comfortable work boots These price ranges probably will be cheaper than dealers' prices who need to pay for overhead and retail space.